LogMeIn lets you access your Mac or PC desktops from anywhere you are. Remote desktop access services have been around for quite a while (being able to access your computers remotely from a different computer) and LogMeIn has been one of the most popular services (mainly because they have a really good free solution and it's easy to setup and connect). 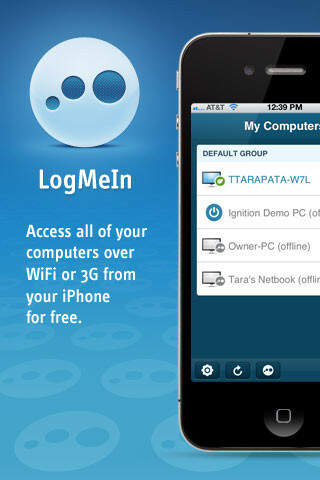 The LogMeIn app lets you control your desktop computer from your iPhone or iPad, and the big news is that you can now do it entirely free (LogMeIn had a different iPhone app called LogMeIn Ignite, which was $100, but this version is now free). The way LogMeIn works is that you download the LogMeIn desktop application to your computer (PC or Mac) and install it. During the installation they ask you to setup a LogMeIn account (which is free for the basic features). Then you can go to logmein.com from any browser in the world and get remote access to any computer you've installed the client software on. 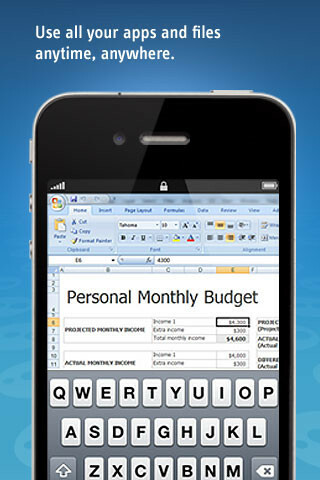 With the LogMeIn app, you can do the same from your iPhone and control your computers remotely. The basic features that are offered in the free account are to view the screen of your remote computer and control the mouse and keyboard. Whenever you want you can upgrade your LogMeIn Free computers to a subscription of LogMeIn Pro and get premium features that include file transfer, HD video, and My Cloud Bank (which allows integration with Dropbox and Google Docs). If you don't need file transfers (which I doubt you need from your iPhone) the free version of both the app and the service itself are all you need. Get them and you'll always be able to connect home and do stuff on your home computer (like spying on people at home using your webcam, suddenly playing music at home to freak out whoever's there, or even actual work like using Office or any other program that you have).